When you noticed the hot unattended iron did you gasp? Not only does Brita iron her shoulder pads to shape and compress them, but during her apprenticeship it was expected the iron would always be in contact with the wool fabric!! I know, I nearly fainted too! But its the continued pressure and heat that keeps those edges crisp, moulding the fabric into shape. Here is the link to the first post about my tailoring holiday in the UK. 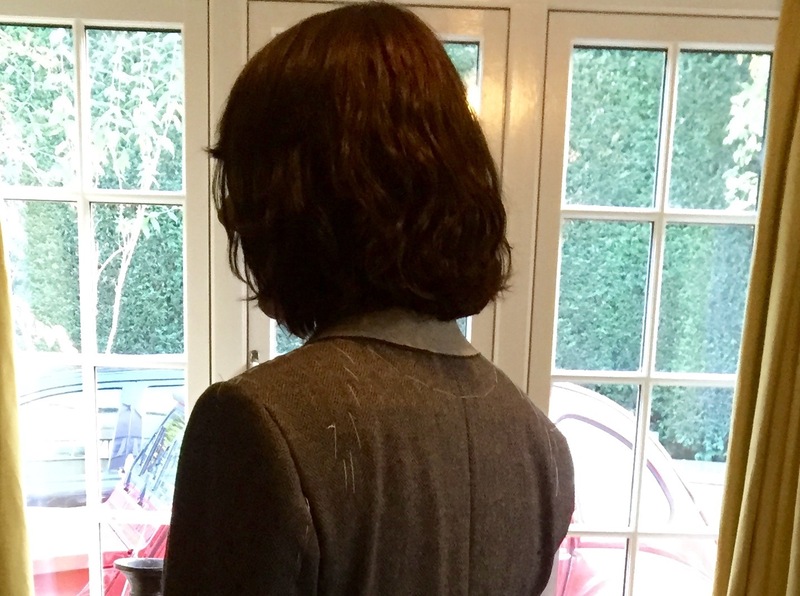 Ironing shoulder pads – new to me. Be gone 80s shoulders, hello fitted shoulder of my sartorial dreams! It had never occurred to me to shape them so they drape the garment closer to the body – nice touch eh? The straight edge of the shoulder pads are cut down after installation so they are the correct shape for the armscye. Pads are secured to the jacket all over the pad area rather than just at the shoulder seam line too. Bria says it can take 2 hours to set a sleeve and sometimes it takes 4 times till she’s happy with it! Apparently “side seams and sleeve underarm seams don’t need to match”. In fact Brita was quite clear, sleeve placement depends entirely upon the pitch of the shoulder and arm position of the wearer. Its the comfort and look of the sleeve as applied to the jacket body that’s important, not matching seams. Cutter and Tailor forums are both goldmine and minefield dare I say, those guys can get so bitchy about a sleeve and shoulder set. Not matching the sleeve and side body seams was attributed to the Neapolitan sleeve, but for the life of me I can’t find that quote now. 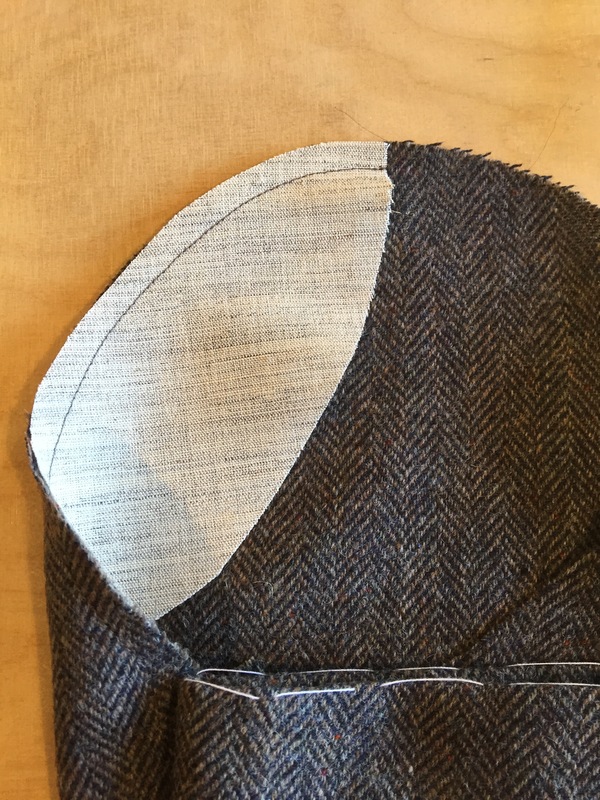 ‘Neapolitan’ also appears to refer to the amount of ease in the sleeve cap and whether or not the shoulder line is ‘roped’ (where the seam allowance falls toward the sleeve to give definition to the sleeve head) or natural (unroped) or somewhere in between. All the time and effort I could have saved myself had I not been wrangling sleeve seams to ‘match’ the side seam and shoulder point – agggh! Same for the under seam of the sleeve. My last jacket block was redrafted over and over to move the back princess seam and sleeve seam so they would match. 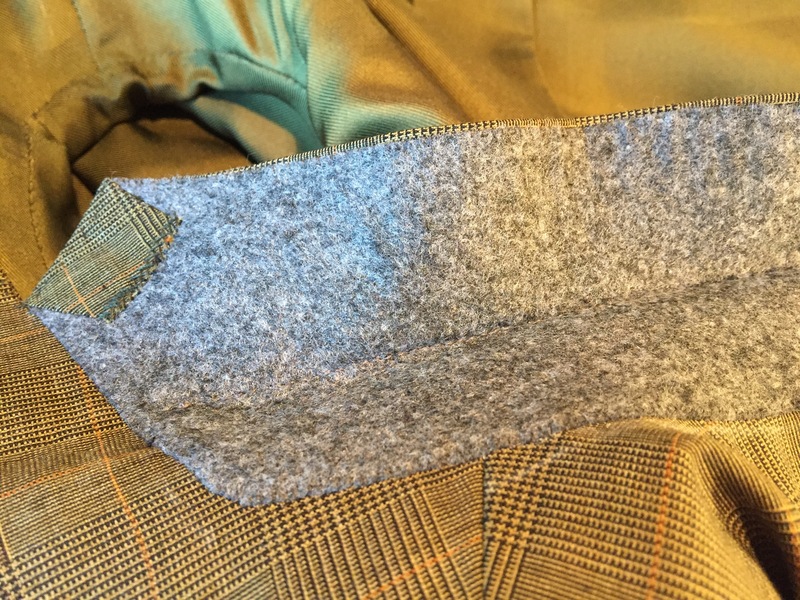 The sleeve seam can end up very acutely angled at the top – let me tell you. Now I can just say “oh that, yeh, its neapolitan – didn’t you know?”, snicker snicker! The fish? Thats the piece of canvas shaped like an ellipse placed at the back of the sleeve head. It helps support the sleeve and creates a lovely shape – I’d never seen that used before – have you? This discussion by Geoffrey D regarding sleeve wadding is fascinating with quite nice diagrams. I like quite a structured sleeve head rather than a ‘natural’ one. I am probably a bit ‘nouveau something or other’ but to my eye it looks smart and I particularly dislike seeing a dip below the sleeve head, then the crown of the sleeve grabbing the top of the deltoid for dear life. Perhaps its becoming a more common sight because of tighter sleeves being more fashionable; give me a high and supported sleeve head that skims the deltoid any day! 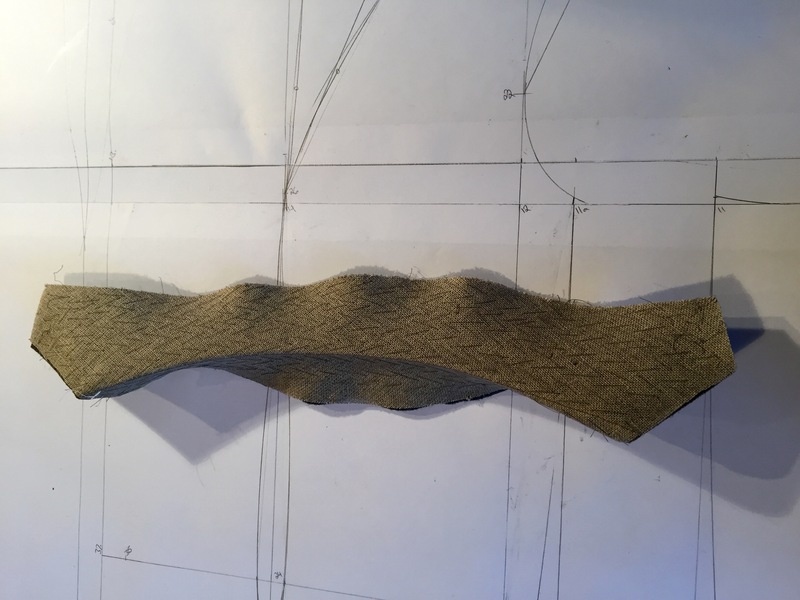 Here is a very nice sleeve head tutorial by Sherry in Auckland from her blog Pattern – Scissors – Cloth, Sherry is just back after a 3 year blogging holiday. Well worth ‘following’ as she works in the industry or at least did when I met her. This is not the only way to apply a sleeve head and I think I recall Brita generally cuts the head down after it is installed rather than before. This post is becoming epic, so I’d better just slip in some photos… but read on to see how my 3 days finished! So here it is during the first fitting. We agreed to take out 1cm from the princess seam above apex to shoulder and move the shoulder in 1cm, also take a little out of the waist. The hem will be raised 1cm as pinned. Not bad for a first draft eh? I was so impressed by the beautiful craftsmanship that I kinda worried that if I finished the jacket it wouldn’t live up to its potential – me being a novice and all. I mean whats the point if I go and shove the lining in all skewiff (also, no lining patterns, Brita makes hers from the finished jacket – de rigeur for men’s tailoring). I was petrified I’d bugger it up actually. So I opted to pay Brita to finish this beautiful bespoke tailored jacket – a great investment in British/German engineering don’t you think? I look forward to sharing photos of the finished jacket when it arrives in the post. Please Mr Australia Post – don’t toss it into the back of your van like Princess’ floordrobe! This is a great resource. Wow! Your head must be bursting with excitement and ideas. The interior looks wonderful. Thanks and I totally agree about the interior (umm did you mean the decor or the jacket innards?!). I loved both! Yes, I’m beginning to appreciate the need for a good skeleton! THANK you!! Brilliant photos and links. I am so nervous about making my first jacket (but I have low expectations anyhow). Your skills are great but I understand why you opted to pay for the jacket to be finished to perfection. It looks like it will be stunning from what I am seeing so far. I’m looking forward to when you make one yourself from scratch with what you have learned. I had to laugh over the Napolitano sleeve thing and seams not lining up because I always just try to see how the sleeve is going to fit on my shoulder and then ease it in in that way, versus trying to line up the seams perfectly (athough obviously I am not talking about jackets yet!) I thought I was only sloppy and amateurish! Ha! Gianni always says that he thinks I’m more “Latina” than “anglosassone,” the descendent of some randy Roman soldier so perhaps this is proof? The iron thing is so interesting. I know I am an inadequate presser (though I do try) and need to learn more, so I’d love to watch the experts do it and get some tips. Incidentally, I was sold some shoulder pads that have layers that can be peeled apart to make them thinner or thicker. Is that legit or ridiculous? I’m already talking fairly thin pads, too, not 80s. I’m hoping to get onto a jacket soon, but the weather is heating up and its hard to muster enthusiasm for wool when a muu-muu is more suitable. Yes, the peeling layers of a shoulder pad are true blue – so to speak. 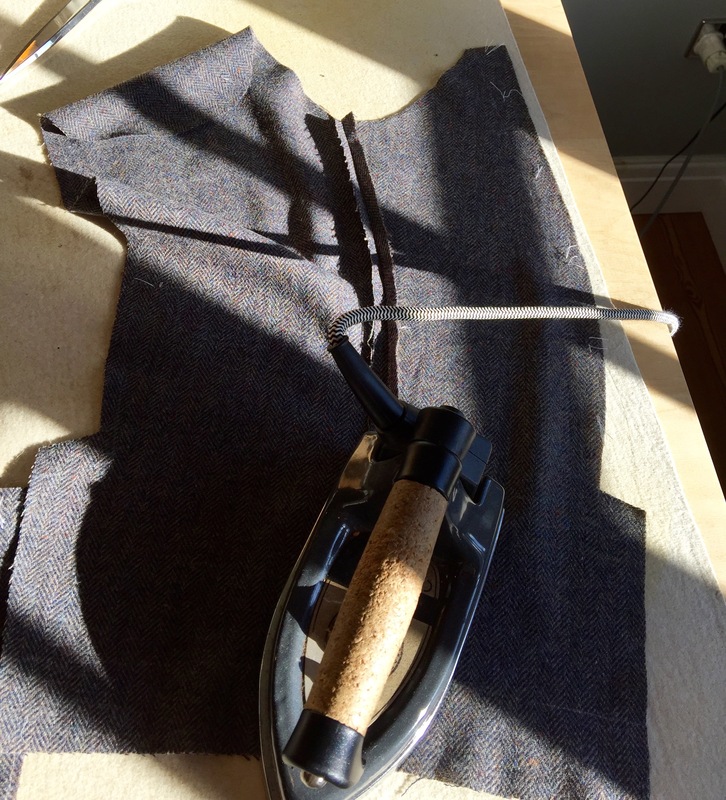 One of the requirements of a shoulder pad is to distribute the considerable weight of the jacket over a broader area, but I’d probably attempt to consolidate thickness with the iron before peeling – just a gut feeling. When Brita irons she really goes for it with some brutality – I’ve yet to give it a go but will let you know! Saw some great links for handmade buttonholes I’ll post soon too. Ultimately. any jacket you make can’t be worse than RTW eh?!! In bocca al lupo – had to look that up! Awesome! I have never made a handmade buttonhole before but that is definitely on my list to learn (especially as my machine makes rotten buttonholes. I think the one jacket I am planning to make and probably the coat uses bound buttonholes, but the other one not. I am reading that Claire Shaeffer book Couture Sewing Techniques and now I want to do everything…I don’t know if I can sew a jacket better than RTW yet, though I will give it a try. Helps to get the feet wet. These are great posts – I’m soaking up the info. Those forums, too. They’re funny in a way but honestly, it’s like sewing p0rn for me. I know that sounds dumb but I like it when people care so much about something that they get a little bit territorial about it. Me too S, though I know I get bogged down in detail rather than just getting on with it! I forgot…In bocca al lupo is perfect! Italians respond with crepi! It is basically “good luck facing your challenge,” but literally it means “in the mouth of the wolf” and the response (crepi/crepi il lupo) means “die” (i.e. the wolf should die and not you). I suppose it makes sense when you are facing a big challenge and the challenge will go down to defeat. I still haven’t received a decent explanation from Gianni as to its origins, though there are lots of interesting expressions in Italian from rural life and so I suppose it comes from hunting. 🙂 I will go at my shoulder pads with brutality – thanks. In the theatre we used to say ‘chockers’, where that came from is anyone’s guess. Wow, what a jacket! I really love the “fish” idea – I’d never seen that before! I’m definitely going to give that a try next time around. 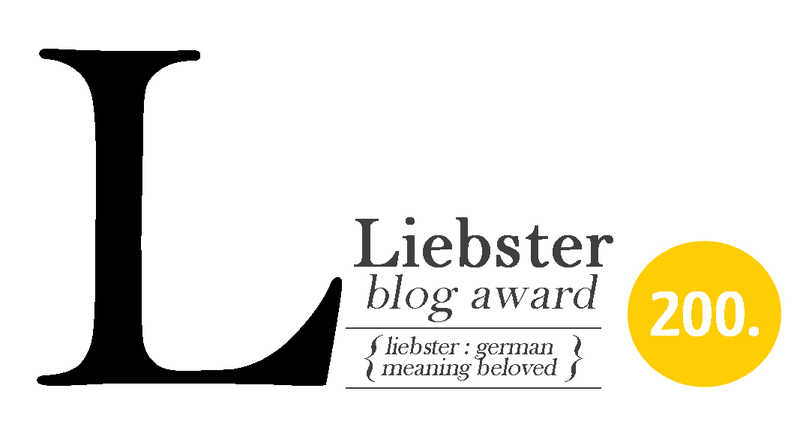 Thanks too for all the great links! Yes the fish seemed to do the trick of stabilising the back sleeve head beautifully. I had wondered if it were commonplace? If you haven’t seen it before (and your jacket making skills are totally awesome) then perhaps its a tailor’s secret – now outta the bag! Chocks away – something to do with taking off in an plane in the 2WW. Anyway the jacket story is fab. Looking forward to the next installment. Yes, could be that. I’m finding it daunting but should bite the bullet and get on with it. The jacket is beautiful. I’m guessing when you make one yourself, or anything else, you’ll realise that you learned even more than you remember right now. A fabulous visit and holiday! I do hope I surprise myself Linda. As a youth I used to record my biology textbook and play it in my sleep, just read some research that apparently that technique really works!! So many interesting aspects to this. It seems the more you delve into this hobby, the more you realise how much there is to learn. In my case anyway. I am currently making a simple top and struggling with the sleeves and now having read this post, it has given me a “of course” moment. Much more sensible to fit to your own body. So obvious when you know. Since I left the comment, Lesley, I remembered watching the craftsy video of the couture dress with Susan Khalje. When she fitted the sleeves she wasn’t that worried about matching up the sleeve seams with the side seams. You know your jacket is going to be wonderful. Whenever you buy RTW from now on it will have to be couture! Oh I bought that class but possibly isn’t get that far. If its good enough for our Susan…!! 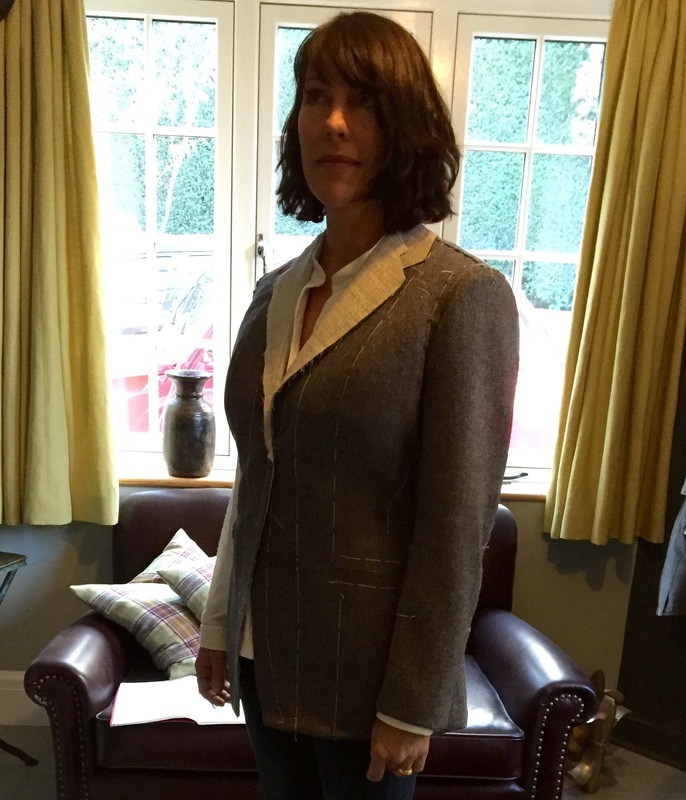 Really lovely to read this very flattering account of your tailoring holiday (love that term, too) at my workshop! I’m glad you took so much away, which is mostly because you arrived with a firm idea of what you wanted to achieve plus being pretty damn quick on the update, if I may say so. All being well, the beauty will be with you well before Christmas, which will be, I gather, challenging in terms of temperatures, to wear a tweed coat? So maybe a tropical weight wool for the next one? Oooh my jacket looks the ‘real deal’ Brita, thank you for sending the link. Also the buttons will be just right and of course I trust your taste – always! I wonder if this wholesaler would sell to little old home sewers like me, their MOP ones are also very nice. I keep telling anyone who’ll listen that 3 days with you were the best part of the holiday, with the Harry Potter Studio Tour coming a close second! Your teaching is very approachable and generous, looking forward to the next holiday! Thank you for all the publicity – i am proud to beat Harry Potter as tourist attraction! Yes, my button supplier has no minimum order regime, should be happy to sell to you and able to handle your request in English. Let me know if they are happy to ship to Australia, or otherwise I’ll ask him to piggyback on my current order and send your buttons along with your jacket. Must start planning my next holiday ASAP! !